Kristine Anigwe reached another milestone in her illustrious career and helped the No. 15 California to their seventh straight win, 67-42 over Cal State Northridge. Anigwe scored 26 and en route became the third player in Cal history to score 2000 points. Colleen Calloway (2320) and Ashley Walker (2142) are the other members of the Cal 2000-point club. Hampered by fouls, Anigwe only played 19 minutes, yet still managed to grab 10 rebounds to extend her streak of double-doubles to seven games. Cal turned a three-point game at halftime into the rout. Kianna Smith contributed 17, and reserve McKenzie Forbes had seven, along with four rebounds and four assists. Receé Caldwell led all players with nine assists. De’Jionae Calloway lead CSUN with 13 points, and Jordyn Jackson had 10. The Bears held center Channon Fluker, who came into the game averaging 16.9 points and 13.3 rebounds, to only seven and five. With the win, Cal is 7-0, while CSUN is now 4-5. Kristine Anigwe scored Cal’s first 12 points as the two teams traded baskets to open the game. With her seventh point, Anigwe reached the 2000-point plateau. Kianna Smith knocked down consecutive threes to give Cal back the lead. But the Matadors scored on three consecutive possessions to stay with Cal. Anigwe hit another basket to close the first, giving Cal the 20-19 edge. CJ West gave the Bears a lift, scoring four points in a Bear 7-0 run to open the second. Her putback got Cal to the 27-19 lead, with 6:47 left in the quarter. Anigwe, playing with two fouls, returned from the bench and quickly hit a basket. The whistle blew, and she prepared to go to the line for a three-point play opportunity. 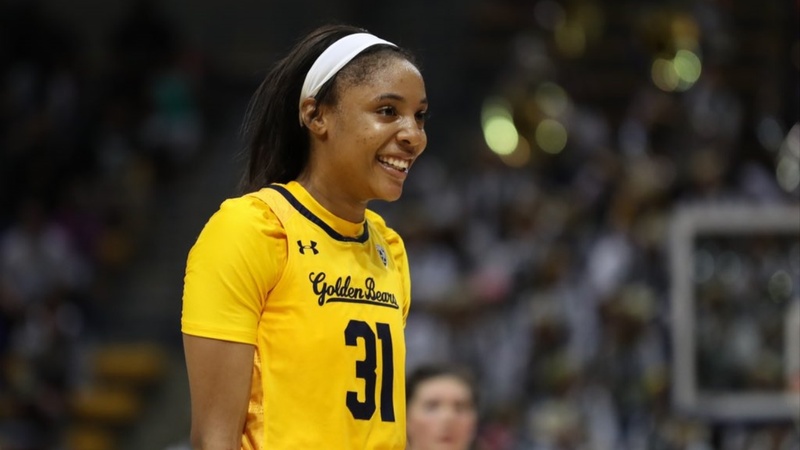 Instead, the call was reversed, and Anigwe was assessed a charge and her third personal foul. Without Anigwe, Cal’s offense struggled to score. Fortunately for the Bears, CSUN was not doing much better. For the quarter, each team managed only four baskets, and both shot the ball poorly: Cal was 4 of 16, while CSUN was 4 of 18. Still, Claudia Ramos’s three cut the lead to 31-28 at the half. The Bears committed to attack the paint to open the third, using player movement to find openings in the Matador defense. Anigwe scored twice attacking the left block, and Smith and Receé Caldwell each hit a basket, earning the Bears their first double-digit lead, 39-28, and forcing a time out from CSUN. The Bears also clamped down on defense, refusing to bite on fakes and providing well-timed help. Anigwe made an emphatic block, and on the other end, after a Bear miss, Thomas made a steal in the backcourt, resulting in another Anigwe score down low. On the play, Thomas got hurt and was carried off the court. With 4:37 to go, Anigwe picked up her fourth foul on a bad screen. Down two starters, and without the full services of CJ West, Gottlieb went with McKenzie Forbes and Chen Yue off the bench, and the subs held down the fort. Yue occupied Channon Fluker on both ends. Forbes showed her versatility, hitting a three and then posting up for a basket inside.With four subs on the floor--Alaysia Styles and Mo Mosley joined the fray--the Bears stretched the lead to 20, 48-28. CSUN closed the third with a three point play by Calloway and a three by Fluker, and Cal was ahead, 50-34. But the Matadors never managed to get much closer, as the Bears continued their team play in the fourth. Five different players scored on Cal’s first six baskets. With the game well in hand, Anigwe checked into the game for a few seconds, just enough time to grab her 10th rebound and preserve her double-double streak. The Bears closed out the win, with Mosley knocking down a three to a huge roar.